Encoding and decoding data is a fundamental part of iOS apps. That is especially true for the JSON data we get from REST APIs. In the past, decoding JSON in iOS apps required a lot of boilerplate code and sometimes fancy techniques. But thanks to the Codable protocols introduced in Swift 4, today we have a native and idiomatic way to encode and decode data. The Codable protocols allow for simple JSON decoding that can sometimes take only a couple of lines of code. But it also allows for more sophisticated techniques when you have special needs. We will explore all that in this article. The first thing you need to take care of when decoding JSON data is how to represent it in your app using Swift types. After mapping data to Swift types, you can easily decode data in a few lines of code. Before we get into the nitty-gritty of decoding, we need to clarify the relationship between code and data. Any iOS app needs to deal with data. So we need a way to represent it and its business logic in code. In iOS, we develop apps following the MVC pattern. 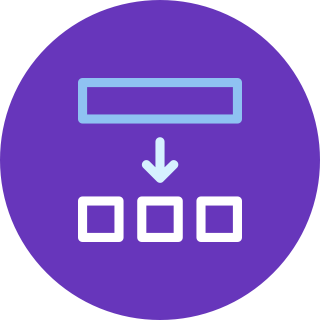 In MVC, we represented data in the model layer, where we use structures and enumerations to represent data entities and their business logic. That is the app’s internal representation of its data. 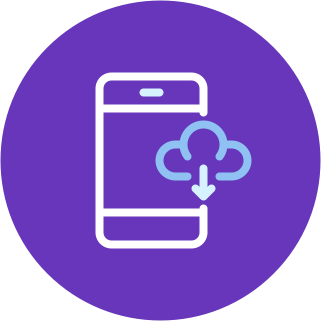 Software often stores data permanently and communicates with other software. For that, we need an external representation of our data. To allow communication, we need a standard format understood by applications written in different languages. In today’s internet, the two most popular formats to represent data are JSON and XML. JSON is the most popular of the two because it has a simpler structure that can be efficiently encoded and decoded. So, most REST APIs return data in JSON format. Since an app has to deal with an internal and an external representation of its data, we need some code to convert from one to the other, and vice-versa. But where do we put that code? I have been for a long time an advocate of putting transformation code into model types. This allows you to keep view controllers lean and avoid massive view controllers. So, I have to admit I was quite pleased to see that in Swift 4, the Codable protocols force you to put transformation code into model types. When you want to decode or encode some JSON data, the corresponding model types in your project need to conform to the Decodable and Encodable protocols respectively. If you need to do both, you can use the Codable instead, which is just the combination of the other two protocols. All the encoding and decoding code gets generated automatically for you by the Swift compiler. And while the Codable protocols are often used for JSON decoding, they also work for other formats, like also work with property lists. In any app, you have to go through three steps to decode the JSON data you get from a REST API. Perform a network request to fetch the data. Feed the data you receive to a JSONDecoder instance. Map the JSON data to your model types by making them conform to the Decodable protocol. You don’t have to write your code in this order necessarily. It is quite common to start from the last one and proceed backward, which is what we will do in this article. To see a practical example, we need some JSON data and, ideally, a remote API that provides it. Luckily, I found this handy list of public APIs, where we have plenty to choose from. For this article, I will use the SpaceX API. We will build a small app with two screens. One that shows a list of SpaceX rocket launches, and one that shows the detail of a selected launch. 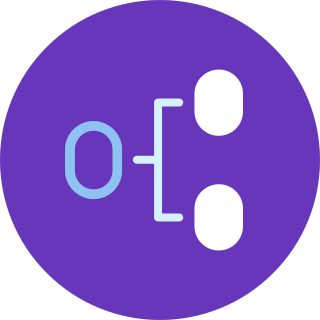 While small, this app will cover all the common cases you find when decoding JSON data. You can find the code for the whole app on GitHub. 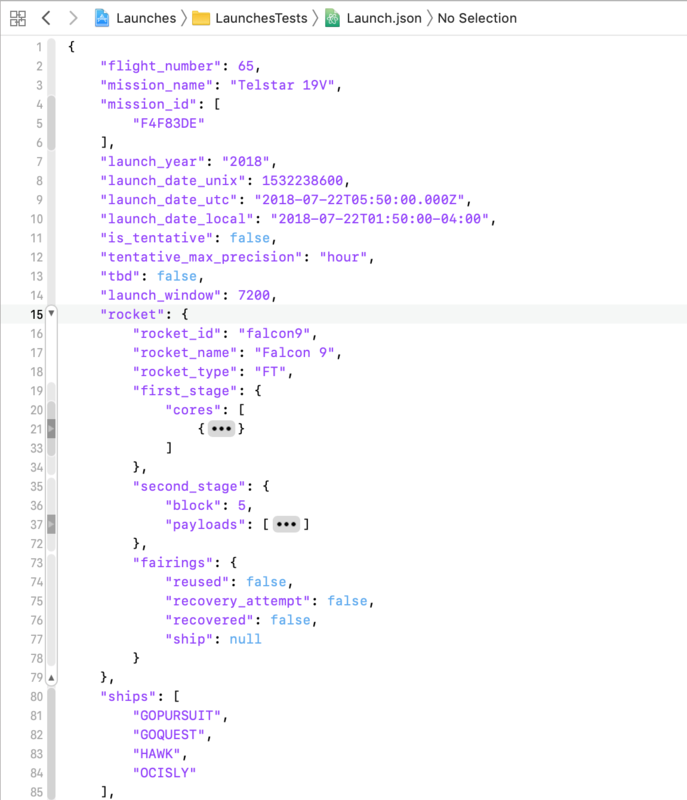 As a start, let’s grab some JSON data representing a launch from the API. The full JSON data for a launch is longer than this, but we can safely ignore any property we don’t need. The first thing we need is a model type (a structure) that represents a launch. name the type’s stored properties following the names in the JSON data. For this to work, every property in our Launch needs to have a type that also conforms to Decodable. But luckily, all the common Swift types like Bool, Int, Float, and even arrays conform to both the Codable protocol. Copying the names JSON fields exactly though would create some atypical Swift code. JSON uses snake case, which is a common practice in web apps. In Swift, we use camel case. But luckily we can match the two. Now that we have a mapping between our type and the JSON data, we can feed the latter to an instance of JSONDecoder and get back a Launch value. The convertFromSnakeCase option for the keyDecodingStrategy is what allows us to use camel case instead of snake case for the properties in our structure. Dates in JSON can be expressed in different formats, so we have to tell the JSONDecoder which one to expect by setting its dateDecodingStrategy. In this case, the launch_date_unix field in the JSON data is expressed in Unix time, which is the count of seconds that passed since January 1st, 1970. We will talk more about other date formats later in the article. We only needed a couple of lines of code to decode our JSON data. We don’t yet have any code to perform network requests and fetch some JSON data from the remote API, so how do we know if our code is correct? Granted, our code is still so simple that it’s hard to get it wrong. But it’s going to grow in complexity, and we don’t want to wait until we have a full app to discover that decoding is broken. First of all, we need some real JSON data. If the API you use does not require any form of authentication, you can open the URL of a resource directly in your browser. JSON data is just text, so you can copy and paste it. Usually, all the white space is stripped to save bandwidth, so raw JSON data is not very readable. Here you have a couple of options. You can first put it inside an online JSON formatter. These formatters usually offer validation too, in case you want to check if some data you generate is valid. You can then copy the output and save it in a file with .json extension, for later use. Xcode allows you also to fold JSON data. 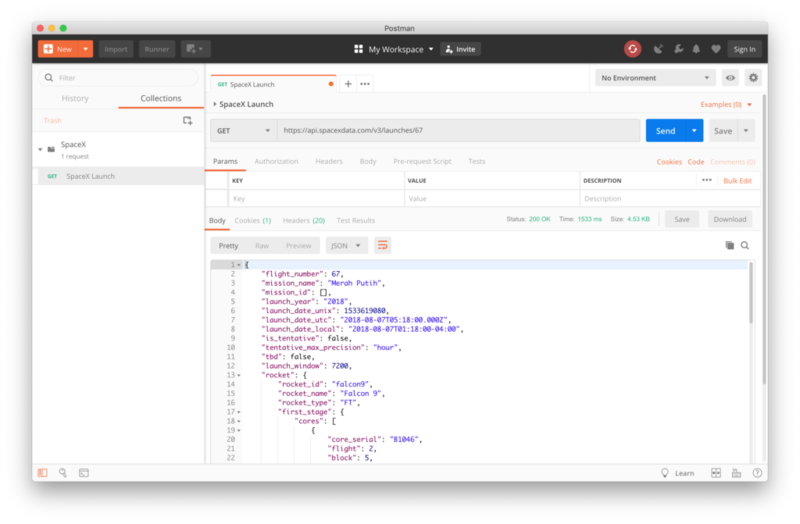 A better alternative is Postman, which is a free app that allows you to make any network requests. 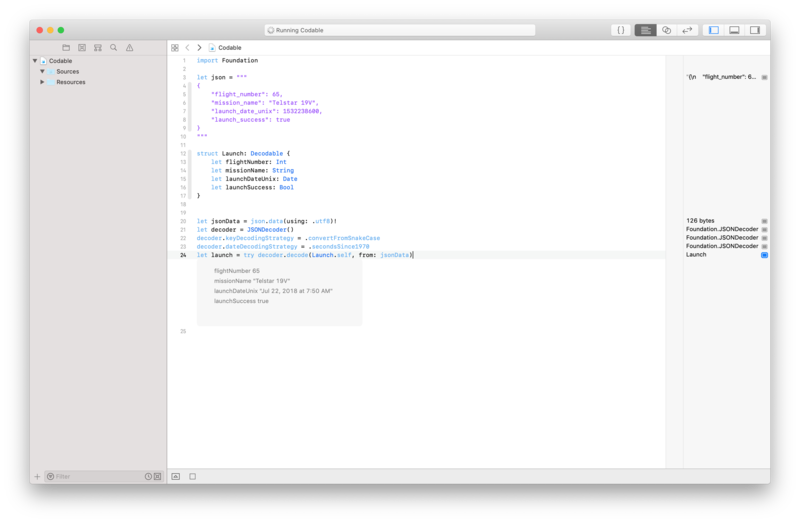 The most straightforward way to test your decoding code is to use a Swift Playground. To write the JSON data in a string that spans multiple lines, use a multiline string literal delimited by triple quotes, a feature that was introduced in Swift 4. If you paste the above code in a Swift playground, you can see the result of the decoding directly below your code. The second way to test your decoding code is to write a unit test for it. First of all, save the data in a .json file in the testing bundle of your project. check each property of the resulting Launch value. This is, of course, longer, but it has all the benefits of unit testing. The code you write in a playground is useful only for a quick test, while you can re-run a unit test to keep your code from breaking. Automatic decoding is enough only for the most straightforward cases but does not respect Swift stylistic conventions. You can use coding keys to gain more flexibility in your model types. It is great to be able to decode JSON data in so few lines of code. But while a JSONDecoder can convert from snake case to camel case, most of the times the property names we get when we mirror the JSON data do not follow the Swift’s API Design Guidelines. launchDateUnix is long and misleading. In the JSON, the date is in Unix format, but in our code, it’s a Date. launchSuccess does not follow the Swift convention of naming booleans to read like assertions. It would be great if we could rename these properties. And, thanks to coding keys, we can. with a String raw value. Notice the plural in the enumeration name and the singular in the protocol name. The compiler requires the enumeration name to be exact. If you misspell it, you can waste a lot of time understanding why your decoding does not work. The cases of the enumeration need to be named after the properties of your structure. Their raw values instead need to correspond to the names in the JSON data. I usually use extensions for protocol conformance, to keep it separate from the type itself. This allows me to move it to another file if I want. But you can put the CodingKeys enumeration in the Launch type itself if you prefer. In software, dates come in many different formats. That also happens in JSON data. Luckily, Apple already thought about it and provided different date decoding strategies for the most common date formats. Above we used the .secondsSince1970 strategy for Unix dates. Another common date format you will find in JSON data is ISO 8601. 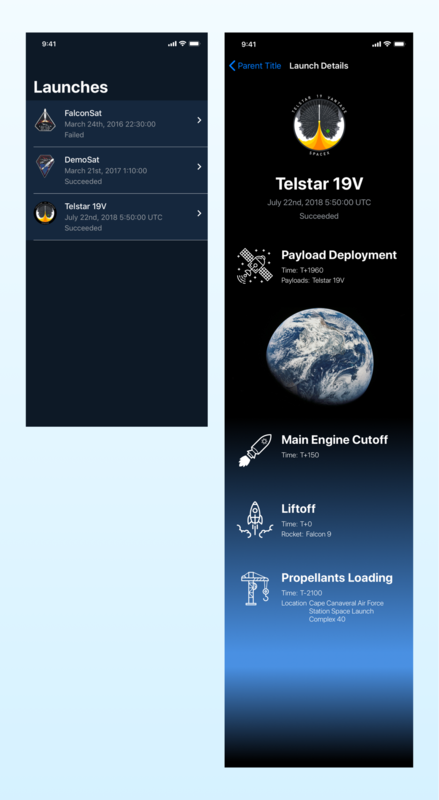 The SpaceX API provides the launch date in many formats, including the ISO 8601. In theory, decoding ISO 8601 dates should be simple. First of all, we need to change the mapping in the CodingKeys enumeration. Then, we need to change the date decoding strategy of the JSONDecoder to .iso8601. It seems that the JSONDecoder class does not like all the possible ISO 8601 date formats, but only a subset. Luckily though, we can fix this problem by providing a custom date formatter. We can then easily pass our custom formatter to the JSONDecoder using the .formatted(_:) date decoding strategy.  JSON allows the encoding of structured data with nested objects. It is rare to find an API that returns only plain JSON objects. Most of the time, a JSON object contains other ones. This also happens the SpaceX API we are using. The JSON data for a launch contains many other objects. A particular one in which we are interested in our app is the timeline of a launch. The simplest way to deal with nested JSON objects in Swift is to create nested types that mirror the nesting in the data. First of all, we need a decodable structure representing a timeline. This time, I made the properties of Timeline optional, because any of them might be missing in the JSON data. If a property is not optional but is missing from the data, the decoder throws an error. We will talk about errors later. Once you have a structure for a nested object, all you need to do is add a property to the structure that needs to contain it. The timeline property is also optional because failed launches don’t have a timeline, so the timeline field might be missing altogether. Mirroring the structure of JSON data often produces types used only for decoding. If you want to break free from the constraints of the data you decode, you need to write custom decoding code using decoding containers. Decoding nested JSON object using nested Swift structures is straightforward, but sometimes it might not make sense in our apps. No rule forces you to mirror the structure of the JSON data you receive from a remote API. In fact, most of the times, you shouldn’t. Your model types should reflect the business logic of your app, even if that diverges from the data you read from an external source. the URL for the patch. In the JSON data, these three pieces of information are inside three different nested objects. "site_name_long": "Cape Canaveral Air Force Station Space Launch Complex 40"
We can decode these too by creating nested Swift structures, but they would all have one property. These new types would not make any sense. They would exist only to decode the JSON data, which is not a reasonable justification. It’s better to add these three properties to the Launch structure and give them simple types. Notice that we only have a URL for the patch. Remember that JSON data is a string and cannot carry binary data like images, audio or video files. While sometimes you can convert those to a string using base 64 encoding, it is more common for JSON data to carry URLs to other resources that you have to download separately. Since our Launch structure does not mirror the JSON data anymore, we can’t use automatic decoding. The compiler can match model types and data only when they correspond. When they deviate, you need to provide more code. The first thing we need is some more coding keys for the nested objects we want to read. Notice that the new cases for the CodingKeys enumeration follow only the names in the JSON data. The Launch structure does not have links and launchSite properties. Since we are going to provide our decoding code, that is not a requirement anymore. Actually, now we can also change the name of the CodingKeys enumeration. It must be named that way only when we use automatic decoding. I also added three new coding key enumerations, for the three nested objects we want to read. I nested those inside of CodingKeys, but that’s not required. All you need is an enumeration for JSON object you want to decode. You can declare them outside of the CodingKeys enumeration. I nest them to keep a correspondence between my code and the JSON data. This makes it easier to read my code later when I will have forgotten how it works. Now that we have coding keys enumeration for all the JSON objects we want to decode, we need to provide our custom decoding code. You place such code in the required init(from:) initializer of the Decodable protocol. Even if this initializer is required, we didn’t have to implement it until now. That’s because the compiler synthesizes it for you if you don’t provide one. Since we don’t use automatic decoding anymore, the synthesized initializer does not fit our needs anymore. Unfortunately, this also means that we now have to decode all the properties ourselves. There is no middle ground. You either use automatic decoding and let the compiler synthesize the whole initializer, or you decode every single property by yourself. To do that, we need to use a keyed decoding container. Containers allow us to read any value we want directly from the JSON data. We get the container for a launch object from the decoder parameter we get in the initializer. When you call the container(keyedBy:) method, you need to specify which coding keys enumeration to use. That’s why now we can name our enumerations as we please. When you read the value of a property, you need to specify what type it has and which key to use to retrieve it. We now need to read the properties contained inside the three nested JSON objects. As you can see, the process is the same. First, we get a container for a nested object from the current container, keyed with the appropriate enumeration. Then, we retrieve the values we want from the nested container. JSON objects do not only contain other objects but can also include arrays. This is a complication you often meet when dealing with JSON data from remote APIs. And indeed, that happens also in the data for a SpaceX launch. A rocket can deploy one or more payloads at the same time, so these come as an array in the JSON data. To complicate things further, the payloads are nested in the second_stage object, which is nested in the rocket object. The nesting, by itself, is not a big problem. As before, we need to create some more coding keys to dig deeper into the nested structures. Now that we have a container for the second_stage object, we have to deal with its payloads field, which is our array. There are two ways to decode arrays. The simplest one is to rely on concrete types, as we did for the timeline. The process is the same. 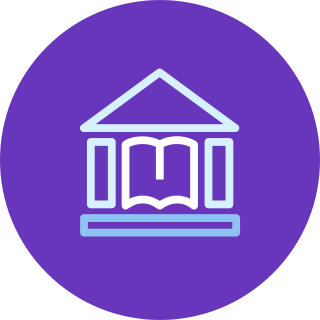 First, we create a new Payload structure that conforms to Decodable, with its coding keys for the fields we want to read. We can now decode the array like we decode any other value, by passing [Payload].self as the type parameter to the decode(_:forKey:) method of the keyed decoding container. The crucial line in the new code above is the first one, where we decode the array. The other three take the names of each payload and concatenate them into a single string for the payloads property of Launch. I used the reduce(_:_:) function here because I like a functional approach for this kind of code. But you can use a common for loop instead if you prefer. While more straightforward, the method above still requires creating an extra structure which we only use for decoding. And again, the Payload structure has only one property, so it does not make sense as a separate type. As before, we would like to avoid creating useless types. For that, we need to use an unkeyed decoding container. Unlike its keyed counterpart, an unkeyed container contains a sequence of values that are not identified by keys. Or, more simply, an array. In our JSON data, the payloads field is going to be represented by an unkeyed container, from which we will extract a keyed container for every single payload. As usual, we need a coding keys enumeration for these keyed containers, which is nothing else than the one we put in the Payload structure. So we have to move that enumeration out of the Payload structure and then delete the latter. Again, I nested it inside SecondStageKeys, but you could declare it independently.  looping over its nested keyed containers and read the payload_id of each payload. payloads += payloads == "" ? payloadName : ", \(payloadName)"
Notice that, while an unkeyed container represents an array, it does not behave like one. We cannot use a for loop to go over its content. Instead, we have to extract the keyed containers one by one, calling the nestedContainer(keyedBy:) method. This is a mutating method with side effects. Not only it returns a keyed container, but it also makes the unkeyed container move to the next element. That’s why I declared payloadsContainer to be a var variable and not a let constant. Each keyed container we extract works like all other keyed containers we already saw, so we use the usual decode(_:forKey:) method to extract a payload’s name. Finally, to end the loop, we need to check the isAtEnd property on the unkeyed container to know when we processed all the elements in the array. Decoding JSON data is only one of the parts of an iOS app. In a real world project, you need to also fetch the data from a remote API, chain network calls and populate the UI of your view controllers. 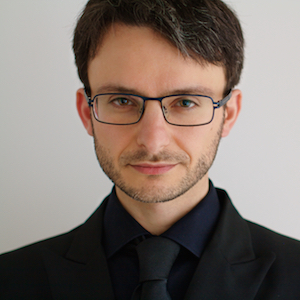 We have seen how to decode JSON data in Swift, but that is not enough. In a real app, you don’t only decode data. You also need to handle it. This means fetching it from a remote API and using it in view controllers. There’s a lot to say about this topic, for which I don’t have room in this article. Here I will only cover the most salient points. For the rest, I have other articles. Let’s start creating the view controller that shows the details of a full launch. Since this is a long, scrolling screen, I used a table view for its UI. 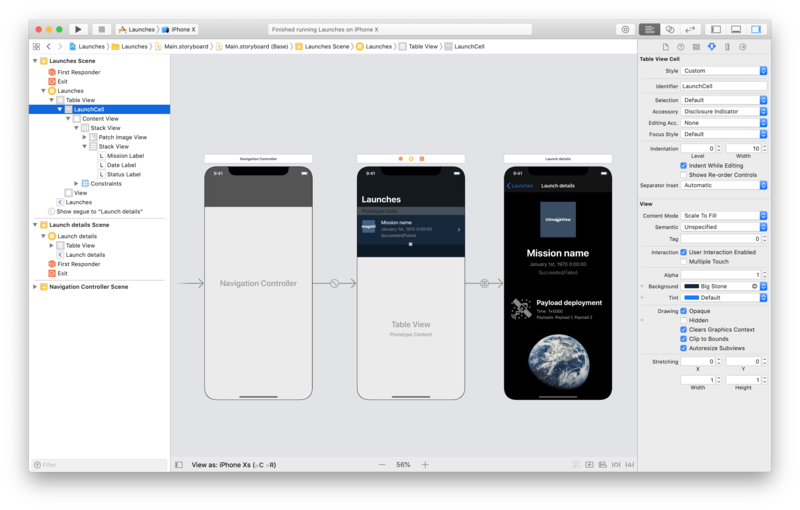 And since this screen’s content is always the same, I set up a static table view in the Xcode storyboard, instead of a dynamic one. This allows us to connect the UI to simple outlets, instead of messing with cell prototypes, data sources, and custom cell classes. @IBOutlet weak var missionNameLabel: UILabel! @IBOutlet weak var payloadDeploymentTimeLabel: UILabel! @IBOutlet weak var payloadsLabel: UILabel! @IBOutlet weak var mecoTimeLabel: UILabel! @IBOutlet weak var liftoffTimeLabel: UILabel! @IBOutlet weak var rocketLabel: UILabel! @IBOutlet weak var loadingTimeLabel: UILabel! @IBOutlet weak var siteLabel: UILabel! @IBOutlet weak var patchActivityIndicator: UIActivityIndicatorView! @IBOutlet weak var patchImageView: UIImageView! We now need to fetch the data from the API. We can do that using a simple URLSession. My recommendation is to never use networking libraries like Alamofire, because they introduce many problems and have practically no benefit. The first important thing to notice is that in an app connected to a remote API we don’t request only JSON data. Often, we need to download other kinds of resources, like images, videos or audio files. So our network request code needs to be generic enough to handle any network request, and not only the ones that return JSON data. As you can see, this code is minimal. There is no need to add a huge networking library to our project for something we can do in a few lines of code. We now need to fetch the data of a launch from the SpaceX API and decode it, to populate our view controller. The LaunchViewController is the object that starts the network request. It is common to start network requests when a view controller is loaded or appears on the screen. let url = URL(string: "https://api.spacexdata.com/v3/launches/65")! For now, I hardcoded the URL of a specific launch, to be able to test the view controller in the simulator. I usually put overrides, protocol conformance and private methods of view controllers and other classes in separate extensions, to keep my code well organized. You can put all the methods directly into the LaunchViewController if you prefer. When we receive a response with the JSON data, we need to decode it using a JSONDecoder, as we saw earlier in this article. In a real app, I would create a whole taxonomy of network request to handle decoding. That requires the use of generics and would make things too complicated for this article, so we will decode the data in the view controller. statusLabel.text = launch.succeeded ? "Succeeded" : "Failed"
In the above code for the LaunchViewController, I put the decoding of the data and populating the UI into two separate methods. It makes the view controller’s code more modular and readable. In the callback of the network request, we need to use a weak reference to self&lt;/code., for memory management considerations. Putting code in separate methods allows us to avoid optional unwrapping and binding. Most importantly, it avoids callback hell. Callback hell happens every time we need to sequence network requests that can start only when the previous one is completed. This happens quite often. For example, whenever some JSON data contains URLs pointing to additional resources. In our case, after fetching the data of a launch, we need to fetch its patch. Modular code is the simplest way to fix callback hell. Some developers use reactive frameworks like RxSwift, but that’s a solution I don’t like. In complex view controllers, I use an approach based on state-machines. That requires a whole article by itself. Anyway, in simple view controllers, modularity is always my tool of choice. While fetching the data for a view controller, it’s common not to show its UI. Since we are using a table view, all we need to do it to return 0 for the rows count from the data source. This works even if we are using a static table view. And while we are at it, we can also add a refresh control. Let’s move to the full list of launches. In this case, we need to use a dynamic table view. First of all, we need a view controller scene with a table view and a cell prototype in our storyboard. We populate the table view using a simple array of launches. @IBOutlet weak var missionLabel: UILabel! For simplicity, I used again a UITableViewController, which acts as a data source for its table view. The best practice here would be to put the data source in a separate class. let url = URL(string: "https://api.spacexdata.com/v3/launches?limit=10")! Like we did in the previous section, we decode the array of launches returned by the API by passing the [Launch].self to the JSONDecoder instance. 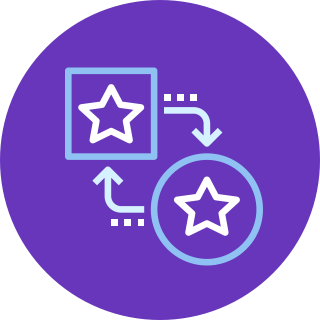 Writing an app that decodes and uses JSON data poses different architectural questions, like fetching separate resources linked by the data and handling decoding errors. Each cell in the table view needs an image for the patch of a launch. We can fetch those the patchURL property of each Launch in the array. We have to fetch each image using a separate network request. But in this view controller, we have some more complications. We want to perform all the network requests at the same time. Then, when each response comes back, we need to update the correct table view cell. To avoid unnecessary network requests and save bandwidth, we need to fetch only the images for the visible rows in the table view. Frameworks like Alamofire solve this problem by adding an extension to the UIImageView class. This allows for a quick solution.  When the data source sets the data in a cell, the image in the cell can make a network request to fetch its image. But that’s also one of the worst architectural practices I have ever seen. Fetching images directly from an image view introduces all sorts of architectural problems. It moves networking the view layer, putting into views responsibilities which do not belong there. This creates all sort of problems related to code reuse, caching of requests, etc. When a cell gets reused and starts a new network request while a previous one is still in progress, you get two requests racing for the same cell. Network requests in a background thread do not necessarily finish in the order they were started. This often leads to cells with the wrong image. Finally, you don’t have any control over those network requests in case you want to cancel or schedule them in an operation queue. All the above problems can be solved, of course, but only by using other bad practices like singletons. The correct solution to fetch the images for the cells in a table view is quite straightforward. So much that I am surprised not to see it used more often. reload the corresponding table view row. This is not only architecturally sound but it also completely removes the problem of images ending into the wrong cell. To store the images we fetch in our data, we need an additional property in the Launch type. When a cell appears, the table view calls tableView(_:cellForRowAt:) on its delegate. That’s where we perform network requests. And we just needed to add one method to our view controller. The fading effect looks a bit weird in this case because the table view cells have a different background compared to the table view. If they were the same, the effect would only fade the images. To get the same result on cells with a different background color. Otherwise, you have to write your own animation code. To complete the app, all we have left is to pass data between the two view controllers. 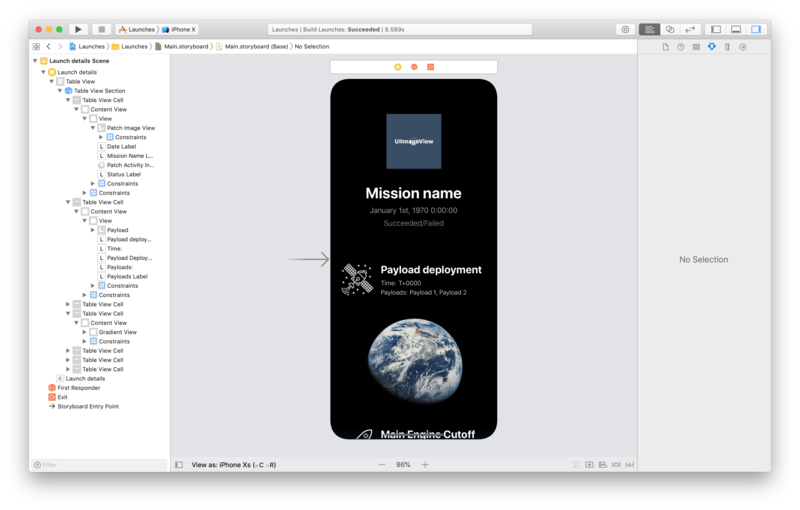 We start by adding a stored property to LaunchViewController. let url = URL(string: "https://api.spacexdata.com/v3/launches")! The last thing we need to cover is how to deal with decoding errors. First of all, decoding errors occur at the level of model types. In the init(from:) initializer required by the Decodable protocol, every time we decode a property, we have to use the try keyword, since it might throw an error. While errors happen in the Launch structure, we are not handling them there. Model types should not be concerned with error handling. An error must be handled by an object that can do something about it. If a decoding error occurs, there is nothing that the Launch type can do to fix the problem. So the only two solutions at this level are to ignore errors or to let them bubble up the call stack. In fact, this required initializer is already marked by the throws keyword in the Decodable protocol. So, by design, data types should not handle errors. The Decodable initializer is called by the decode(_:from:) method of JSONDecoder. And, indeed, this is also a throwing method, which rethrows any decoding error. In a more complex app, it is a better practice to place decoding at the model controller level, especially if you follow the protocol-oriented networking approach I show in this article. While a model controller might have the ability to address some errors, most decoding errors can’t be handled by model controllers. These usually happen because of corrupted JSON data or when the remote API changes its output. There is nothing a model controller can do about that, so again, all it can do is let any error rise to the surface. That surface is the view controller layer. View controllers are the objects that can make decisions when errors happen. Sometimes, the simplest way to handle an error is to ignore it. In such cases, we can transform any error into an optional using the try? keyword, as we did in the LaunchesViewController. When a view controller ignores an error, it might have to hide the UI for the missing data. Some view controllers might still preserve some of their functionality in such cases. That’s not the case for our LaunchesViewController, which only displays a list of launches. All we get when we have no data is an empty screen. If that’s acceptable depends on your app. Usually, though, you want to make the user aware of the error. There are many solutions to show a message to the user. The simplest one is using an alert controller. let title = "Oops, something went wrong"
let message = "Please make sure you have the latest version of the app." Regardless of the way you handle an error, it’s vital that errors don’t get out of a view controller. Any error that escapes a view controller gets out of your control and will crash your app.  The Codable protocols introduced in Swift 4, paired with keyed and unkeyed decoding containers, allow for sophisticated decoding of data.  The most common data format to which these apply is JSON, but the Codable protocols work with any data format that has a similar structure. Another such data format is property lists. For those, the iOS SDK offers the PropertyListEncoder<b></b> and PropertyListDecoder classes. Everything we saw in this article still applies. While at the end of the day a plist file contains XML data, this format has additional restrictions that make the Codable approach possible. For full XML data, you need to instead use the XMLParser class. Unfortunately, decoding XML is not as straightforward as what we saw in this article. The nitty-gritty details we saw here are not the only important aspect of decoding data. Another important point is appropriately structuring the code. If you want to see how to properly architect a full app that includes the encoding and the decoding of data, join my free course below. This entry was posted in Uncategorized on March 26, 2019 by Matteo Manferdini.